The principal amenity within the Diamondhead Community, the scenic 18 hole, par-72, PGA rated championship golf course is surrounded by a beautiful, relaxing landscape. The course was created for golfers with discriminating taste who are seeking an enjoyable golfing experience at an affordable price. 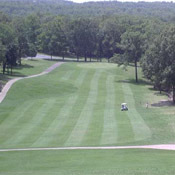 Designed with all handicappers in mind, this unique course has four sets of tees that provide a challenge to the best golfers while still offering the average player or beginner the opportunity to play an enjoyable round of golf.